The demands of the campaign made me a spectator on all things Inner Arbor, but I'm excited by the opportunity to come back to this project and find it well on its way to becoming a reality. 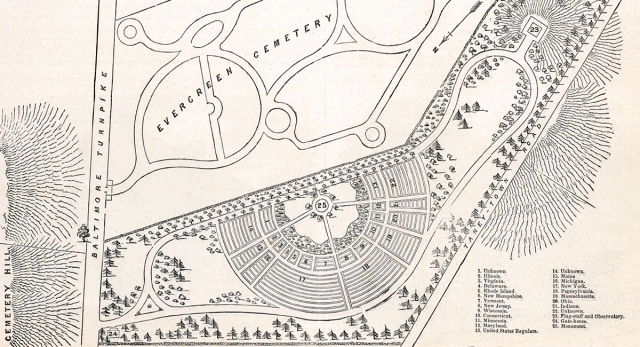 I must admit that I am surprised by the persistence of what is commonly referred to as the "Paumier Plan", which may just as easily be described as the "Fountain Plan" due to the absence of any other defining features. Since its inception, this plan has always reminded me of something, but I could never put my finger on what. A place I had been. A place where I was required to be quiet and reverrent. 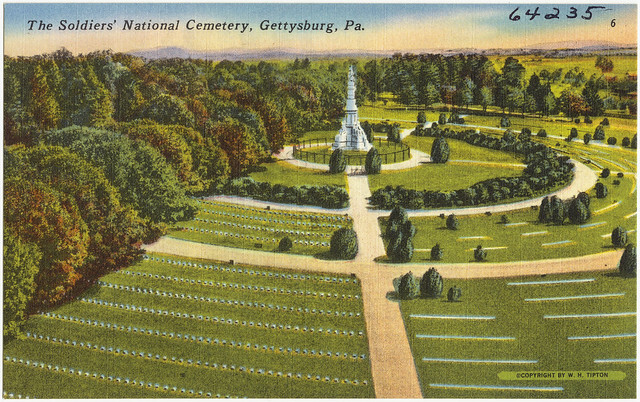 The Soldiers' National Cemetery in Gettysburg, Pennsylvania. I would challenge anyone to identify a meaningful difference between the two designs, other than the latter's historical significance. In fact, if Mr. Paumier and his "Design Team" had kept the original cruciform pattern, the designs would be nearly identical. We need to stop referencing the "Paumier Plan" as a reasonable alternative to Inner Arbor. The only reason it is being discussed as such is to provide a foundation for opposition. As Frank Hecker correctly noted in this April 2014 blog post, the same individuals who now support the Paumier Plan had previously opposed it for cutting down too many trees (see Hekimian, et al.). This is a bad plan, it is a boring plan, and it would standardize our Downtown in ways that are fundamentally opposed to the promise of redevelopment. 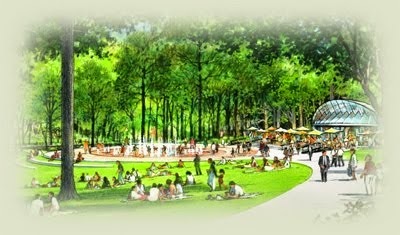 Let's discuss the merits of the Inner Arbor Plan and the challenges of such an ambitious park, but let's stop this ruse of alternative design. No cemeteries in Symphony Woods. Let's make Columbia Awesome. Have a great Saturday doing what you love!